Gift Givers and Present Buyers – Fix. Serve. 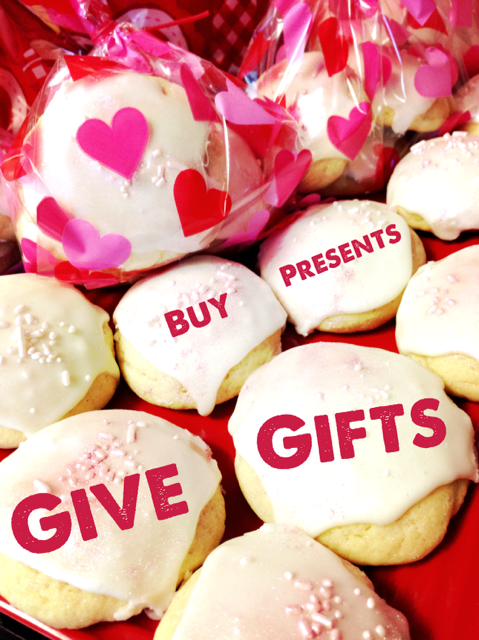 During this week leading up to Valentine’s Day, I’ve been on my soapbox about the difference between giving a gift and buying a present. I love, love, love giving gifts. To anyone. I even keep a note of gift ideas in my phone because I often see things that remind me of people in my life or overhear them say something the sparks an idea. My gifts have run the gamete from something simple purchased from the store, to some nuns in Italy I made friends with via email because of a certain gift that I was dead set on acquiring for someone. If I have something in mind for you, I don’t stop unit I find exactly what I want. Given my passion for gift giving, it would seem that Valentine’s Day would be right up my alley. Let me tell you, it is NOT. I want nothing to do with Valentine’s Day due mostly in part to the fact that it’s a present holiday. See, in my mind, the opposite of gift giving is buying a present. Buying a present is what I do when I forget that my son has a birthday party and we run to Target to buy a toy for a kid I have never met. Buying a present is what I do when it’s Christmas and I need to leave something for the mailman, the teachers, or the trash guys. I certainly do mean well with the present, but it’s not a gift. Present buying lacks a deeper level of thought and individuality. The impetus of present buying is the need for an item because of a timeline – a party, a holiday, etc. Whereas, gift giving is the exact opposite. The impetus of gift giving is the person. The thought of the person and their unique interests ignites the idea for a gift. There’s not always a timeline. A gift can be given anytime, to anyone, for no reason at all but that you thought of them. This is why I cringe at registries, lists and forced fun holidays. Don’t tell me what you want! I will go find something that reminds me of you and is truly a gift from me to you. Otherwise, let’s just go to Target and I’ll spot you a $20 and you can buy whatever you want. PS – these are the cookies I made. Make these cookies for no reason at all. They are hands down the best cookies ever and my go-to recipe. Annie’s Eats, Soft Frosted Sugar Cookies. I agree. I love to give gifts. But I hate buying things for people just for the sake of buying something. When presents are in order, though, I like registries because at least the item will be wanted.